In the white robes of his priesthood a pace back from the shoulder of the king, Royal Councillor, Bronan, stands every inch the regal Druid. Rumours say he feeds the heads of their enemies to a chained dragon, mixes potions by the light of a caged fairy, and his gift of Sight sees not only into a man’s soul, but the future, the past and everything in between. And he’s a fair hand with a blade. Even against the best of the Royal Guard, Sir William. A good thing, too, because in Edenshire? These are dangerous times. After kindly King Manfred left Princess Brigit orphaned over a decade before, his brother, Barry, succeeded him in much more than the throne. In only a year, they dubbed him Barry the Red. A despot reputed for his appetites, his secret gaol is the venue for his unholy feasts. All Bronan’s powers can’t stop him and the kingdom drowns in blood. He must save them. But an old hurt says he broke his own honour and so, is unworthy. Divination shows him only the flames of destruction. He knows he’s damned. But without him, Edenshire is doomed. 4th century Britain is changing. 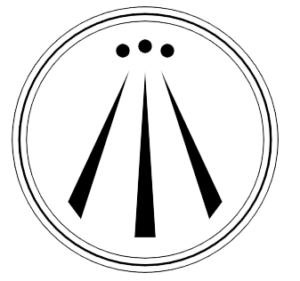 But while Christendom sweeps earthy gods into myth, magic lives in Edenshire. As does a desperate, improbable plan. A secret plan known only to Bronan and the old king. A plan born of magic. A plan yet fulfilled. Barry wants him dead. Blood stains the realm. The dead cry for justice. And the Goddess waits for balance restored. If Bronan can keep his vow to the old king? Magic may save them all. 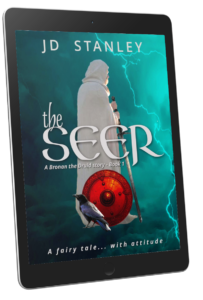 “I liked The Seer by JD Stanley. It was, in many ways, a typical sword and sorcery tale and I like those. But a few things made it a little different too. It was a little wittier than the usual tale in this genre. I felt the wit helped move the reading along and made it funny. I appreciated that. The Seer has a serious, complicated plot, but it is not mind-numbingly dramatic. JD Stanley handles telling the story by using a deft sense of balance. I like that. He tells a good story because he writes very well. The story appealed to me because I like action. I like adventure. I like stories set in feudal societies. They appeal to me for reasons I haven’t examined too closely. 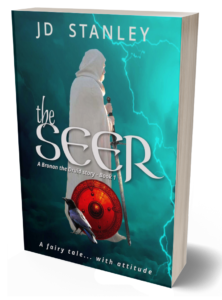 They appeal to a lot of people and, if you are one of those people, you will love The Seer.